CPC is pleased to announce the launch of its redesigned website. Over the last few months, we have been working to redesign the face of CPC. We have listened to the member feedback to learn what is working well on the website and what we needed to take away and improve. Aside from it's new look it is a more user friendly and accessible site. To illustrate the changes made during our improvements, please take a look at the Key Features coming to the redesign. A more user friendly and accessible site: The new site aims to produce an optimal viewing experience regardless of what device you are using. Regardless of whether you are looking at the site on a mobile phone, tablet or desktop PC the new website should expand to the full width and all content should be easy to read. New Contracting Pipeline feature: Here you can see all of the frameworks CPC are working on. Member institutions can make their own suggestions and vote on what frameworks we look into next. Simplified Supplier Directory: We have made the listing of agreements clearer and made it more accessible to users who are not logged in. The search engine has been revised to make it quicker and easier to find a relevant supplier or agreement. New homepage layout: We have made the site clearer and easier to navigate, highlighting key site deep links, which will improve the Member / Supplier user journey. Frameworks / Supplier details: Hierarchy of information has been improved making it simpler for a user to navigate and find information on a framework / supplier. Training: A new top level navigation has been created for this section, over the coming month(s) this will house training sessions, online training videos and related links. 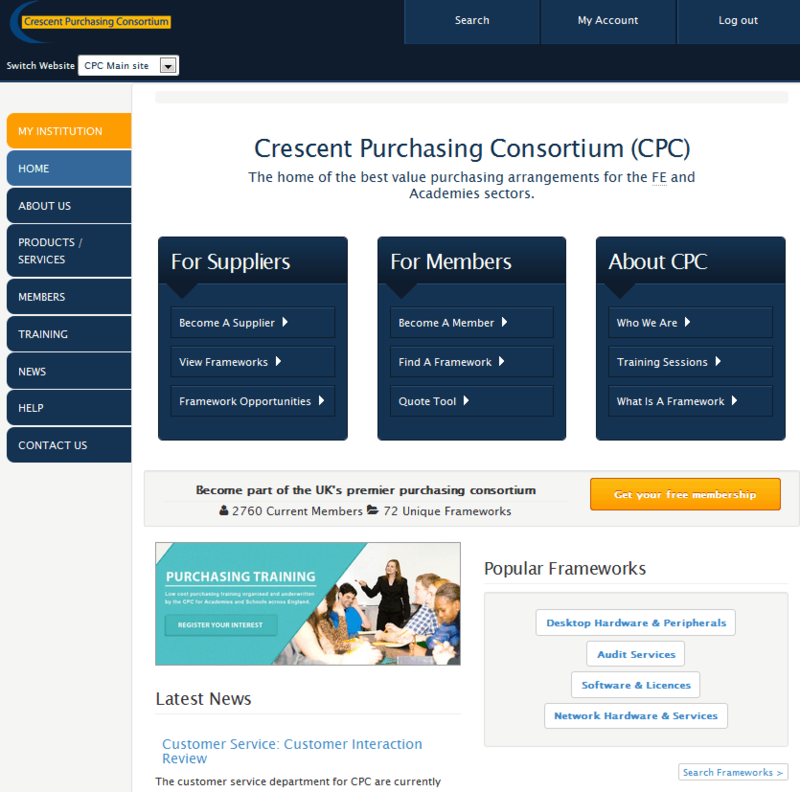 As well all these exciting changes to the customer view of the CPC Website, there have been many changes made in the background of the site. This will enable us to more efficiently measure a deeper level of analytics so we can ensure we are delivering the most relevant content. We hope you like the new site as much as we do. If you have any questions about the features of the new website, or experience difficulties while logging in, please contact us at web-team@thecpc.ac.uk.